A serene environment, aptly suited for the Buddhist way of life, surrounds the Bright Filial Piety Temple. 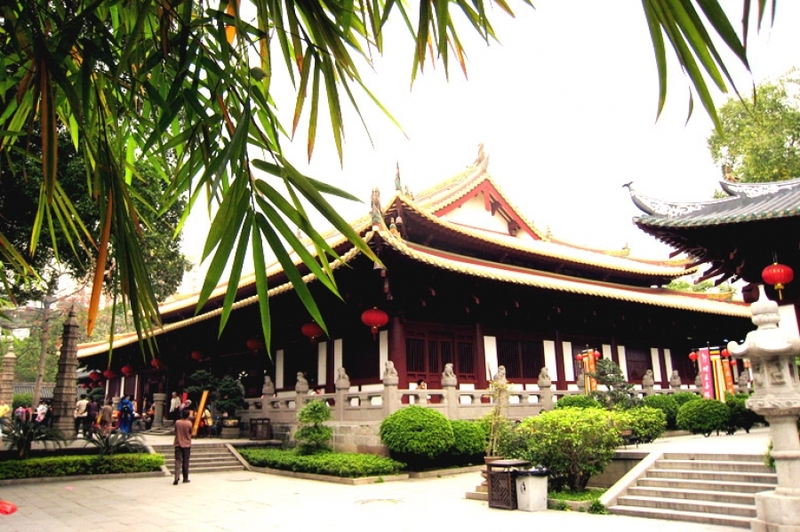 It is one of the major Guangzhou attractions that you will come across during your stay in the city. This ancient Buddhist temple has a history that is about 1,700 years old. If the rumors are to be believed, this temple was founded even before the establishment of this city. As per an order issued by the State Council, this temple is known as a Key National Cultural Preservation Site. This Buddhist temple has a very interesting history. It was built during the reign of the Western Han Dynasty, and served as a lecture hall and private house. The residential facility was used by Zhao Jiande of the dynasty, who was the son of Zhao Tuo. But once the Southern Song Dynasty came into power, the temple became a place of worship for the Zen Buddhist monk. This was during the time period of 1127-1279 AD. Since then, this temple has been a residing place for many Buddhist scholars and monks, who have dedicated their life for translating sutras and spreading the message of Buddha all over the world as well as China. The most famous monk who has ever stayed in the temple was Hui Neng. He was the sixth master of the Zen Buddhist sect. It was in this temple that the monk was initiated to the religion. This Chinese temple has four halls, namely Mahavira Hall, Heavenly King Hall, Sixth Ancestor Hall, and Samgharama Hall. The Mahavira Hall or the Great Hall is the oldest of these and was built in the year 401 AD during the reign of the Eastern Jin Dynasty. However, successive rulers and royal families made significant changes, thus helping the expansion of the hall. This hall is considered to be the best architectural creation in the southern part of China, and has influenced other such temple designs in the rest of China. Inside the temple, travelers will find three Buddha statues. The Heavenly King Hall too has its own historical importance to boast of. It is believed that the Spring of Washing Bowl is the place where Bodhidhamma, the first guru of the Zen Buddhism, washed his bowl. It was built in the year 527. But the hall's most prized possession is the Helen Stele, which is about 380 years old. You should also take a look at the Dharani pillars that has the etchings of Mahakaruna Dharani Sutras. The Sixth Ancestor Hall has a giant statue of Master Hui Neng. You will also find a Bodhi tree just behind the hall, and Yifa Pagoda, an octagonal structure, built in the memory of the Master. The Buddhist temple also had the East Iron Tower and the West Iron Tower. However, only the East Tower survives today and has about 1000 shrines. This Chinese temple is also home to what it calls the Grief Bell that is rung during the prayer meetings. This Buddhist temple remains open from 6 am in the morning till 5:30 pm in the evening. In order to grasp the beauty and the historical significance of the Bright Filial Piety Temple, you should have sufficient time in hand. Buses are available from various parts of the city and you will have to get down at Renmin Beillu stop to visit it.